Marshall M. Fredericks Sculpture Museum | View of Detroit Edison Company, site of the "Alex Dow Portrait Relief"
View of Detroit Edison Company, site of the "Alex Dow Portrait Relief"
Dow was appointed water commissioner for the city of Detroit in 1916-1921 and again in 1925-1932. In 1932, he was made the president of Detroit Edison and served until 1940. He was elected president of the American Society of Mechanical Engineers for the 1928-1929 year. This bronze portrait plaque is located at the Detroit Edison Company in Detroit, Michigan. 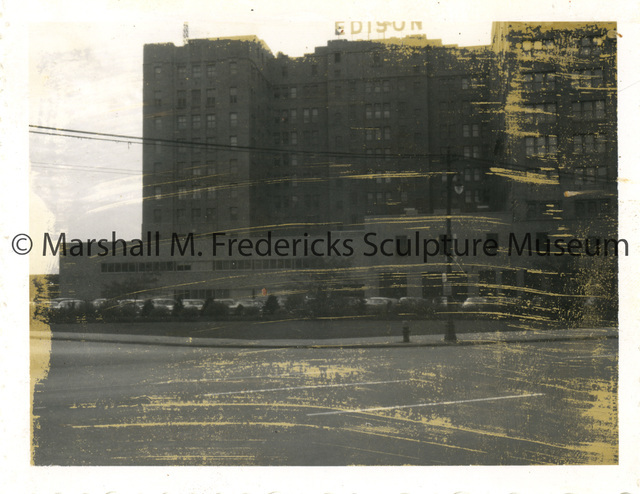 Unidentified photographer, “View of Detroit Edison Company, site of the "Alex Dow Portrait Relief",” Marshall M. Fredericks Sculpture Museum, accessed April 22, 2019, http://omeka.svsu.edu/items/show/8064.